Who doesn’t love any permutation of the Easter bunny? It usually means chocolate can’t be too far away. This project is made from the humblest of materials – a simple can. The result, however, is charming and anything but expected. There are so many ways to customize this project, from the paint color that coats the can’s exterior to the patterned or solid color fabric used to fashion the bunny ears. Place atop the table for Easter brunch, or on a stool outside the front door to add a little Easter cheer. You can also use this piece as a vase or Easter candy receptacle. Pick your sugary Easter poison: Will it be jelly beans, candy-coated chocolate mini-eggs or marshmallow Peeps? 1. With the paintbrush, coat the can's exterior with the chalk paint. 2. 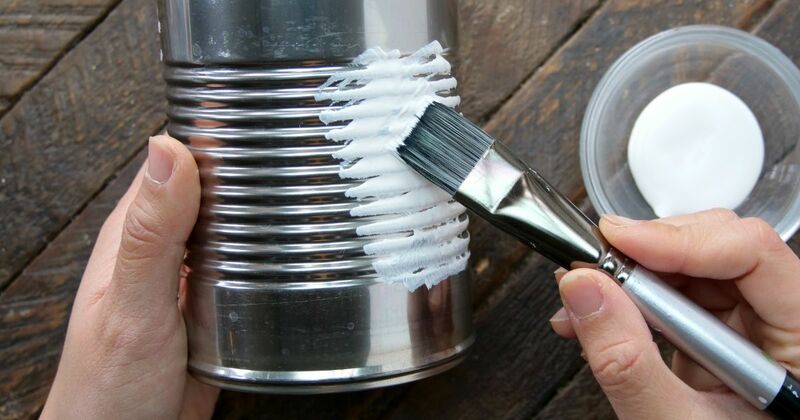 Apply a second coat of paint to the can for complete coverage. 3. Allow the paint to dry. 4. Take an old handkerchief, bandana or fabric square and, using the Sharpie marker, draw an outline in the shape of a rabbit’s ear, about an inch wide and four inches high. The ear should have a flat bottom and rounded sides that meet in a point at the top. 5. Repeat step 4 to make a second rabbit ear. 6. Cut the ear template with the scissors. 7. Take the fabric ear pieces and outline the backsides with glue from the hot glue gun. 8. Place the gluey backsides next to each other on the piece of white felt and affix them to the felt. 9. Cut the felt-lined earpieces so that each has a thin border of felt that extends from the fabric’s edge, about 1/8 of an inch. The felt will allow the ears to stand up on the piece without flopping over. 10. Apply clear glue to the bottom front portions of the ears. 11. Affix the ears next to each other on the inner top portion of the can's open edge. 12. Use the scissors to cut two small circles from the black piece of felt. These will be the rabbit’s eyes. 13. Next, cut a small triangle from the pink felt for the rabbit’s nose. 14. Glue the eyes next to each other about a third of the way down from the top of the front of the can. 15. Slightly below the eyes, glue the nose so the triangle’s tip is facing toward the bottom of the can. 16. Allow the glue to dry completely. The piece will then be ready for display. If you like, cut four thin strips from the black felt for bunny whiskers. Or, you could use a couple of small pieces to make eyebrows or eyelashes, then glue them on too for added personality. Have fun filling your tin can Easter bunny with whatever you wish. 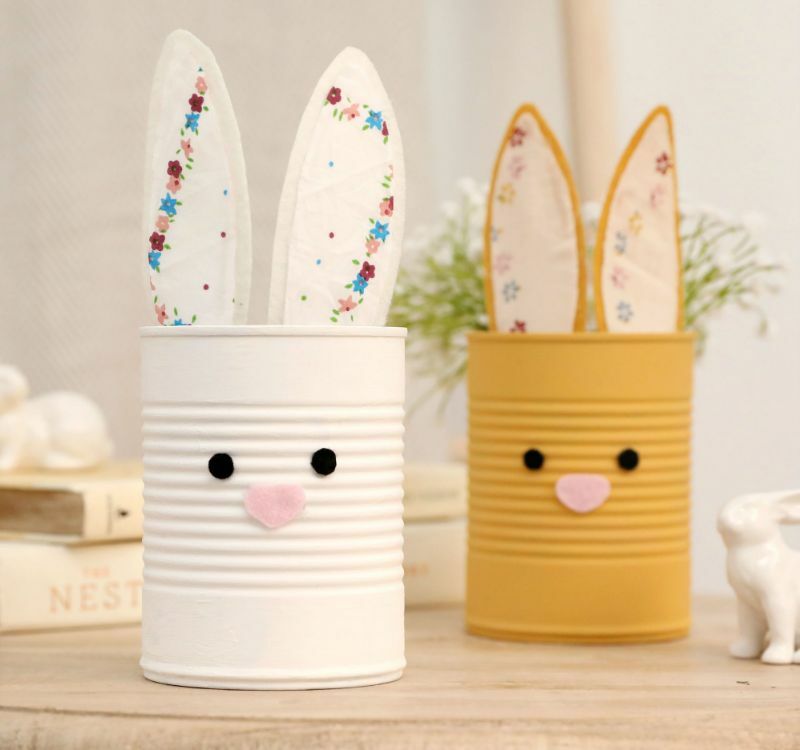 Share this adorable Easter craft on Facebook.